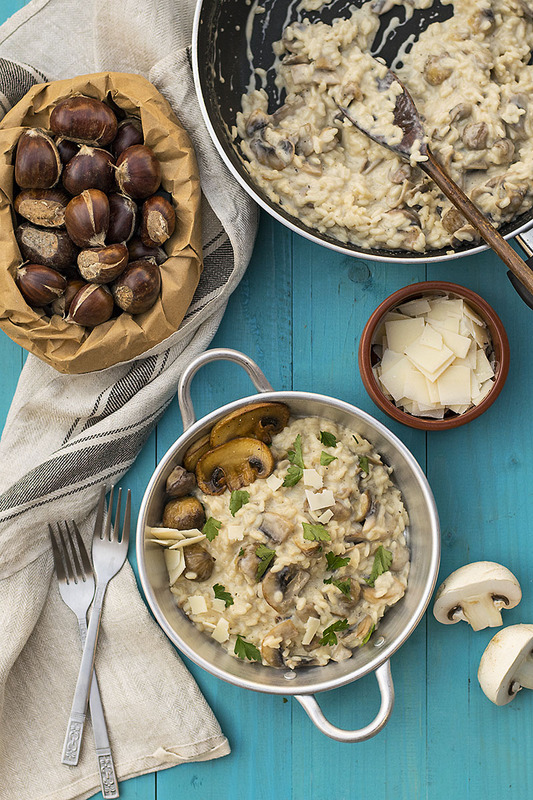 This mushroom and chestnut risotto is a warm and cozy dinner, especially during winter! It’s simple, easy, low-fat and gluten-free! 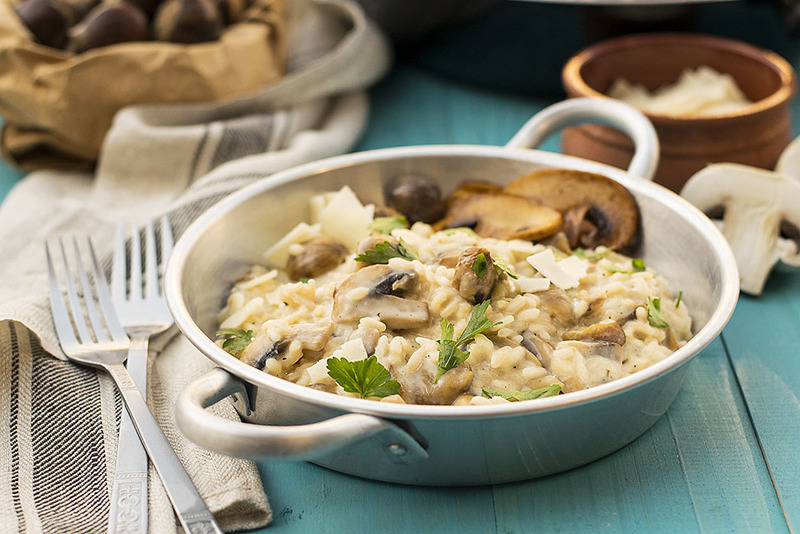 Who else thinks that you can never have too many risotto recipes? If you answered “me!! !” then you’re my kind of people! 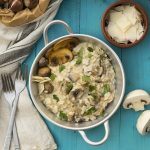 This mushroom and chestnut creamy risotto recipe takes advantage of the warm and nutty taste of chestnuts and combines it with some earthy mushrooms to create a simple and comforting dish. It doesn’t have any bold flavors that will punch you in the face, but it will make you love it for its subtle, mellow character which will warm your heart. Plus, it’s easy to make and doesn’t require many ingredients, so it’s perfect for this time of the year when we’re in the middle of a baking frenzy trying to get ready for the holidays! Personally, I still haven’t made not one batch of almond snow cookies (kourabiedes) or even a pan of honey-soaked cookies (melomakarona) both of which are Greek traditional cookies found in every home this time of the year. So, as you can understand, there’s a lot of work to be done! 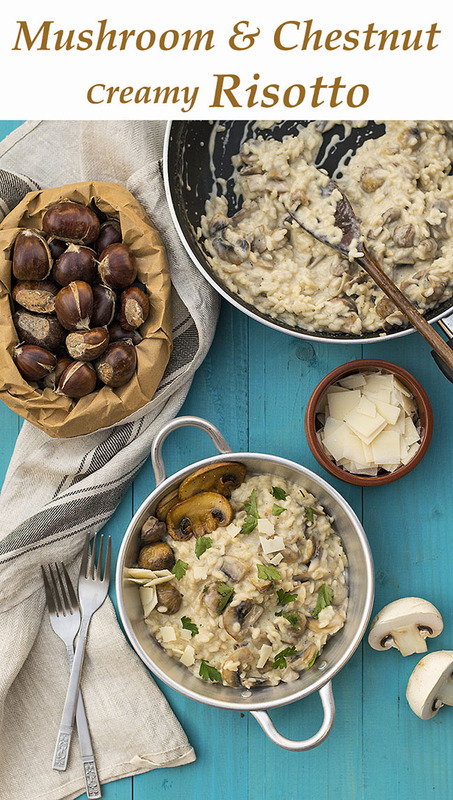 This recipe doesn’t use any butter and all the cream is replaced with evaporated milk, so it manages to stay lower in fat than your average risotto. 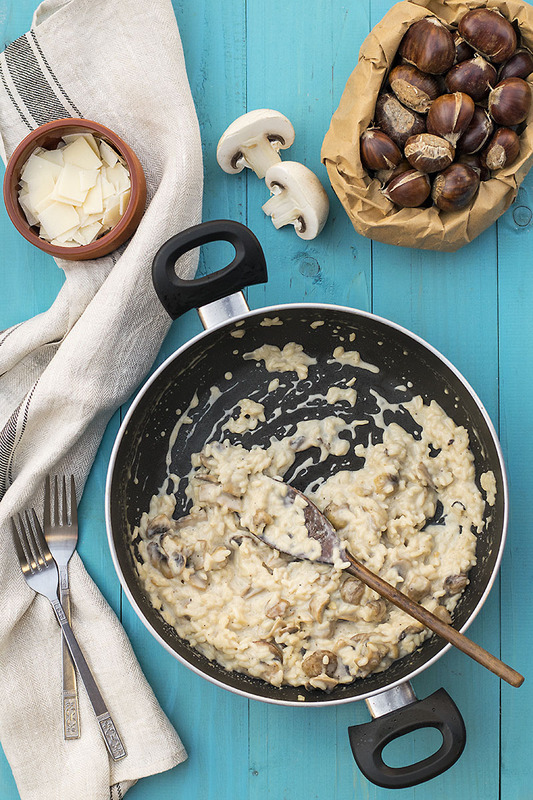 However, keep in mind that some fat is introduced from the grated parmesan cheese which makes this mushroom and chestnut risotto extra creamy and flavorful. Another thing that adds to the creaminess is the right type of rice used, so choose wisely! See notes/tips below for some good types of rice usually used for risotto. This recipe doubles easily, you’ll just need a large saucepan. To enhance the flavor of the mushrooms you must sauté them in a very hot pan, without stirring very often, until they are well browned and caramelized. When we say parmesan cheese we mean Parmigiano Reggiano! Use a type of rice suitable for risotto such as Carnaroli, Arborio, Carolina, or San Andrea. You can substitute whole milk for evaporated milk with a slight difference in the end result. 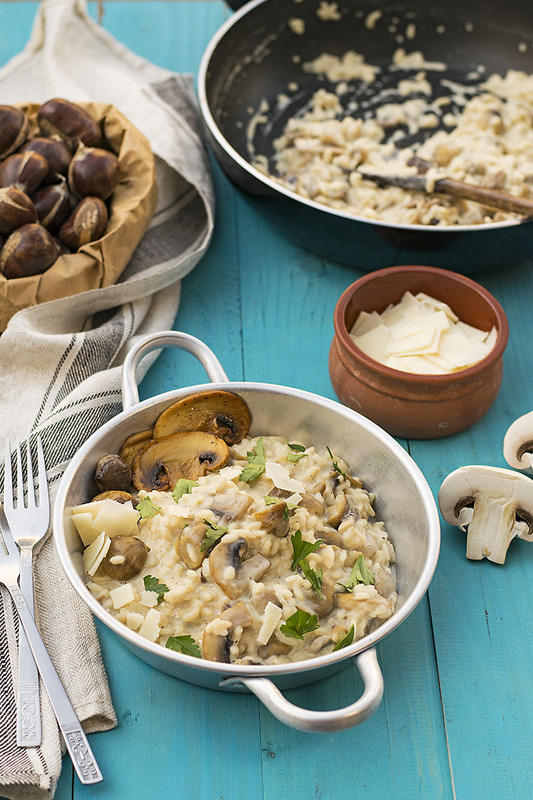 This mushroom and chestnut risotto is a warm and cozy dinner, especially during winter! It's simple, easy, low-fat and gluten-free! Transfer the broth to a pot, bring to a simmer and reduce the heat to very low to keep the broth hot. In the meantime, heat a large pan over high heat, add the mushrooms and the olive oil and sauté until well browned and caramelized, about (6-7 minutes). Reduce heat to medium/high and add the onion and garlic. Stir until the onion is translucent and soft (about 3-5 minutes). Add the rice, salt, and pepper and stir for 1 minute. Add the wine and stir until almost evaporated, then add the chestnuts and start adding the broth gradually, about 1/2 cup at a time, stirring quite often and waiting for each addition to be absorbed before adding the next. If needed, reduce heat to a simmer. When you have used about 3 cups of broth, add the milk and start tasting the risotto to determine when it’s ready. At this point, you may or may not need the extra cup of broth. When the risotto is almost but not completely ready, add the parmesan and stir for 1 minute until thick and creamy. Serve immediately. If you’re feeling adventurous, try adding some grated nutmeg and a bit of lemon zest just before you take the pan off the heat. Delicious and hearty <3 I am a mushroom lover and this looks absolutely fantastic!